I often think that assembling the perfect hi-fi system is a bit like cooking a meal. You need the correct blend of ingredients and then to adjust the seasoning so that it is just 'right' for your own teaste.And for many people, adding a bit of 'tube sound' to a system can cure it of being rather clinical. I've received several emails from class-T amp owners who swear by the addition of a valve pre amplifier. Indeed, I've tried my own valve pre amp with class-T amps and it is a good combination. 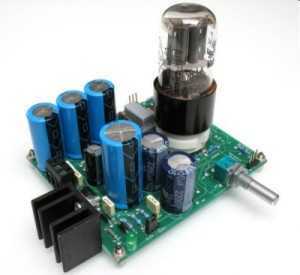 However, building a tube pre amp from scratch is beyond the abilities of a lot of folk, and isn't too tempting when you are talking about the high voltages that some of them use. The subject of this review is a valve pre amp module that requires a minimum of user input, no high voltages, and will easily slot into a system between the source and power amp. 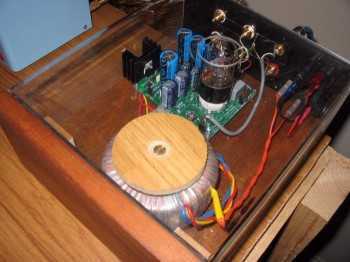 The TubePre comes as an assembled and tested module. There is no case, and no power transformer. The customer supplies these, thus keeping the cost to a minimum. The module comes with some classy RCA sockets, and some nice shielded hook up wires. The transformer required is an 18-0-18 type and I would suggest one with a minimum rating of 50VA (I used 80VA as that's what I had). You will also need a few other items like an IEC socket, fuse holder and fuse, mains switch, and perhaps a terminal block or two. For the technically minded, the TubePre is supplied with a Sovetek 6SL7GT (single-ended triode) valve. It operates in Class A, and uses no global feedback. The input impedance is quoted as 47K; that means virtually any souce will work into it without any problems, and the output impedance is quoted as 'low"! Take it that means it should be low enough to work well into any amplifier. The volume pot supplied with the module is made by Alps. It is a relatively easy job to build the TubePre into a finished item but be aware that you will be working with mains voltages so only tackle that part of the job if you are completely confident! The major part of any DIY hi-fi project is the casework. For this review, I knocked up something fairly quickly from some waste acrylic sheet and timber. Considering the almost zero cost, I reckon it looks OK so feel free to copy the design that can be made with surprisingly few tools. There are just four main parts: the base, a simple rectangular off cut of blockboard although it could be MDF or plywood, the back panel made up of an off cut of black acrylic sheet, the front panel made from some veneered mahogany, and the 'cover' made from clear acrylic sheet that is bent over a simple wooden former, using a hot air gun. It took less than a morning to complete the case and add an IEC socket, switch, fuse holder, and RCA sockets, and another hour to install the module and transformer, and wire it all up. Once completed, I checked for any DC on the outputs, and then left the TubePre powered up for 24 hours before I started listening. The system chosen for the first audition was an SB3 feeding a Monica2 DAC, the TubePre, and the a Virtue Audio Virtue.ONE class-T amplifier feeding my Goodmans 201 open baffle speakers. I should also add that I didn't have the 50K pot fitted that is supplied with the TubePre. I use the volume control in the SB3, and also have a pot inside the Virtue.ONE. So the pot was replaced with a pair of voltage dividers providing approximately 12 db of attenuation on the input of the TubePre. Powering up the system, I was pleased to note that there wasn't a sign of any hum, or other noise coming from the speakers. The TubePre itself, sounded very slightly thin to begin with but that changed after a day or so of using it. The sound was clear, musical and without any negatives. Comparing it to my Pedja Rogic Jfet buffer, there was actually much less to choose between them than I had anticipated. Both sounded slightly on the warm side of neutral and the TubePre was a bit more 'up-front'. Or should I say that the Jfet buffer was a bit more laid back? And the TubePre was a bit more 'punchy' than the Jfet buffer. Obviously the rest of the system is going to play a part in deciding which of the two would sound best in the long term. Ironically, as I had wanted to hear a tube in front of a class-T amp, I thought the combination was not as ideal as the Jfet buffer and Virtue.ONE class-T.
Now it so happened that I had a new chip amp to audition for another review. I knew that it had a lowish input impedance so the TubePre was an obvious choice to place between it and the source. I don't want to say too much about the sound of that system as it is the subject of another review, but suffice to say, the match of TubePre and chip amp was sublime. I probably shouldn't be too surprised by that as the owner of a valve-buffered Gainclone, but if you own a basic chip amp, I would urge you to try something like the TubePre with it. I thought the TubePre really brought the chip amp to life, and the results were particularly pleasant. I didn't want to leave this review without trying the TubePre with a couple more amplifiers. So up next was the Monrio MJ integrated amplifier. When I reviewed the MJ, I felt that it didn't hold my interest very well. Well the TubePre worked wonders with the MJ giving it that something 'extra' The music was more emotional (and therefore involving) while retaining all the good points that the MJ had without it. It's was an excellent combination. Last up I tried one of the smaller class-T amplifiers. The DiyParadise Charlize is a very popular class-T amplifier and sounds pretty good on it's own. But again, possibly due to impedance matching, it sounded better with the TubePre. There's nothing exactly I can point to, but the presentation is more enjoyable. If I had to nail it down, I would say that the timing was slightly improved. As with all the amplifiers that I tried the TubePre with, I didn't get the impression that I was hearing anything added to the music although it isn't totally transparent (no active pre/buffer is of course) . Other than that, I can't really find anything negative to say about the TubePre at all. I strongly believe in an active stage between most sources and the power amplifier. I know that others disagree, citing that the absense of an extra active stage is preferable. In my own experience whenever I have gone for the passive approach, I have enjoyed the music more when I went back to an active buffer or pre amp. As they go, the TubePre is as fine a pre amp/buffer as you will find for that sort of money. The build quality is good, and I like the little touches such as the inclusion of connectors for quickly connecting the inputs and outputs. No doubt there are a few improvements to be got from perhaps a different valve, and playing around with alternative DC blocking caps. But even as it comes, I am pleased to give the TubePre a hearty recommendation!